With all my posts about the Rolling Stones and Madonna Confessions Tour concerts, Chartres Cathedral, and Nice & Cannes, I have neglected one very important basic human need: Shopping. As a serial shopper, I feel guilty (I am Jewish after all) about leaving my readers in the dark about the joys of Paris shopping. One of the great things about Paris shopping is that there are still many individually owned boutiques with unique merchandise that have not given into the corporate/mall landscape like in the U.S. The Marais in particular is a treasure trove of chic and unique boutiques lining the narrow, cobble-stoned streets and featured below are 2 very special shops. Lobato is every shoe fanatics fantasy come true: a ladies shoe shop having the latest, chicest shoes, boots and handbags from designers Balenciaga, Pierre Hardy, Marc Jacobs and Martin Margiela. The shop is small and jewel like and the owner, Miguel Lobato is so passionate about his shoes and bags, that he treats them like his children. The fall 2006 collection is just in, with emphasis on very high platform/wedge shoes and flat riding boots. Bags by Charlott Vasberg and Jamin Puech are large and many are slouchy with butter soft flat finished leathers. The season’s colors are brown, black, gray and red. His terrific eye for style with this superbly edited collection promises even the most addicted shoe and bag junkies a new fix. Here is a fresh new idea in the nothing-is-never-really-new skincare world: Having someone hand make your own skincare products right in front of you and you choosing the ingredients. When interviewing owner Stephane Mottay, a soft-spoken, articulate Frenchman with a long background in developing perfumes, he readily explained his concept while constantly rubbing exotic oils and scents on me for the next half hour. Selling his own Canzi line and others including Dr. Hauschka, Weleda, and Phyt’s, the emphasis is on the freshest, organic only ingredients. As we spoke, he concocted a facial scrub in front of me made of lavender, almond, clay and rose damas. He spread the delicious smelling scrub on the top of my hand and my dishpan hand went from dry and flaky to smooth as a baby’s bottom. The interior of the store is modern, sleek and white with a warm contrasting dark wood floor. I also like the laboratory feel of the shop with test tubes and chemical beakers on the counter filled with mysterious liquids. Every Monday night from 6-8:30PM Stephane teaches a class on how to make your own products like masks, scrubs, and perfumes at home using the ingredients from the shop. He also gives the recipes to the students and teaches how to detect organic and fresh products from regular ones. The shop also sells detox drinks and fresh vegetable juices expressly mixed to benefit the skin. In January, they will be opening a day spa in the back of the shop featuring massages, facials, and body scrubs using fresh products from the Paris open markets. 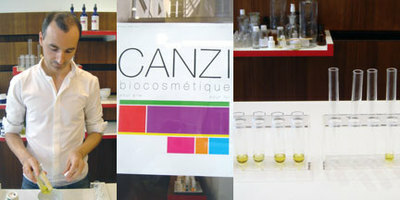 I walked out of Canzi smelling like a rose, a bouquet of lavender, and an herb garden of mint, basil, and marjoram. Boy, did all these great scents make me hungry and I went straight to lunch.